Sounds lovely. However it seems like there’s enough panel space to provide VC feedback. Would be nice not to surrender a VCA. Perhaps an Echo II ?? Hello, I just have a quick question before this PCB shows up for me to assemble 🙂 looking at the schematic, I don’t see where you put the 5V regulator at, but I assume you’re powering it through the +/-12V rails just like the DIRT filter correct? 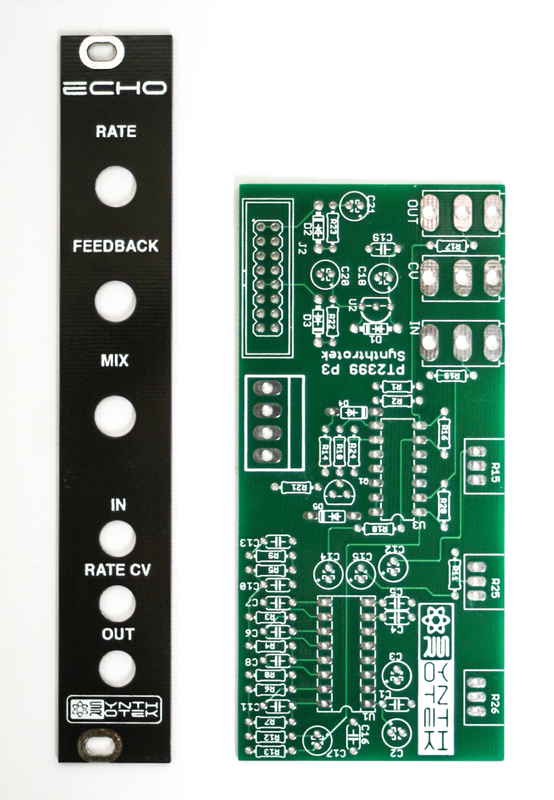 It would seem kinda redundant to pull it from the eurorack 5V rail, but I just want to make sure so I know if I need to rig up a 5V power supply before it arrives or get ready to cut some traces haha. Hi Emu, there is a 5v regulator, but no need to connect it to the +5 rail. 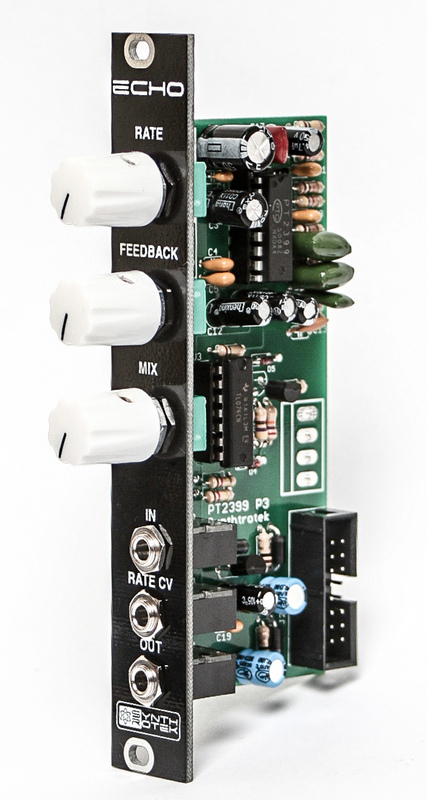 We have a new delay module that is coming out soon, that has cv over feedback and a true wet/dry mix. That sounds wonderful – any news on this upcoming module? Pretty close to finished! Look for it in the next couple months. If you’re signed up for our newsletter, we’ll keep you posted on it. Question 1. Is it normal that the mix knob introduces feedback? Seems like both knobs are combined a bit? It would be great if the new unit gave single delays when there is no feedback. Great to have CV feedback! Hi Mark, we changed it because of a legal challenge to the name. Q1: We have a new module (coming soon) called the DLY that has a true wet/dry mix. The ECHO is a great addition to any Eurorack setup. There’s no shortage of unusual effects you can squeeze out of this gadget. After building the first one and hearing what it can do, I ended up buying another one. Freakishly twisted sounds from the Twilight Zone escape from this doodad when activated. 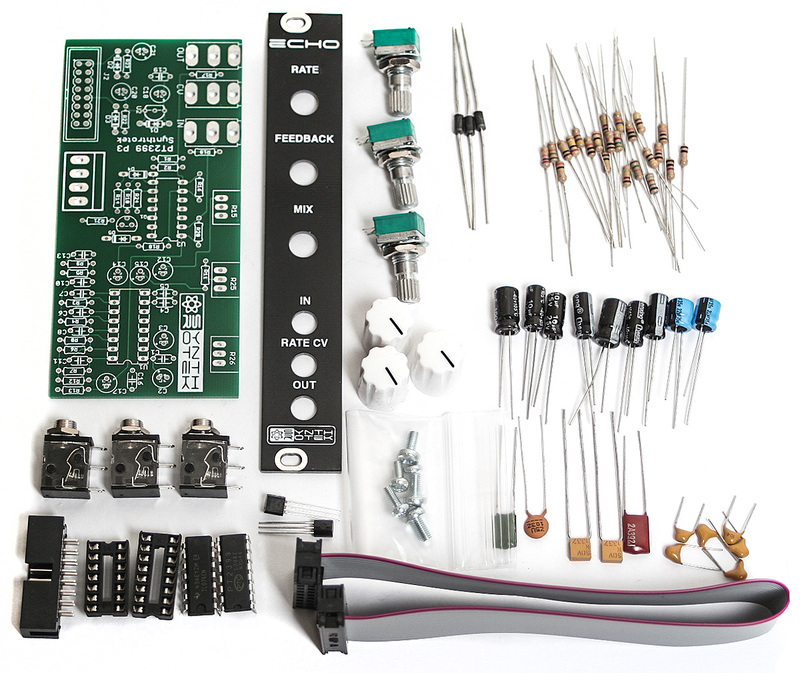 The kit was very easy to build and it’s the best bargain I’ve seen for a DIY Eurorack effects module. Highly recommended. In the schematic, I don’t see the TL074 power pins. Does these are connected to +12V/-12V ? there is someway to get 100% wet signal from the EKO module? some mod or hack? The ECHO doesn’t have a 100% wet or dry signal, however the DLY module does. We don’t have a hack or mod for this, just the DLY. Lovely echo module. Sounds great with a sine wave on a slow attack setting. Some far out stuff in the extreme dial settings. Watch your monitors for feedback!. Very easy to build as Synthrotek provide excellent BOM and build instructions, in addition, all the components are connected to a cardboard strip in the order of build. Genius!! Why can’t all DIY kit suppliers do that? Our company certainly takes pride in making the DIY experience enjoyable and I’ll pass this on to our kitters as late-day smile boost.